It would be my last day in South Africa today and after traveling ten weeks through this interesting and summer hot country, I was honestly looking forward for a change. The last weekend, the reportless and uncounted days, I have stayed in a hotel in the suburb Sandton. My backup team had arranged all this and actually all the expenses could be paid by donations of people I don't know. Someway I just needed that weekend off, doing nothing serious and not being a guest for a few days. Recharging batteries or whatever you can call it. Today I checked out the hotel at 11am and headed towards Hyde Park, where the office of eTravel is located. 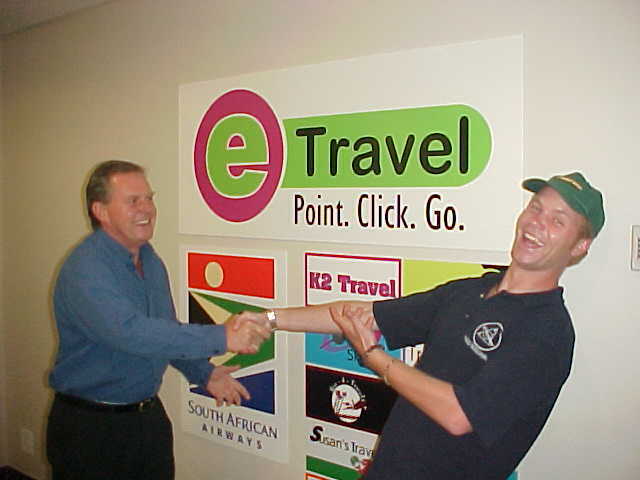 eTravel was the Internet travel company that sponsored all costs of my flight to Johannesburg from Amsterdam, put me in the Ten Bompas Hotel, sent me out to the Manyaleti Game Reserve near the Kruger Park and next to sponsoring my return flight to Spain, they even made British Airways Comair helping me out with the inland flights. So you can understand why I really felt I had to visit that office one more time. I met up with workaholic Bob Williams, the man who was basically all in charge of the Operation Letmestay in South Africa. He believed in my project so much that he just wanted to award me for my great idea and helped me to South Africa. Without his vision I probably would never made it to this country ever. So, Bob, thanks! 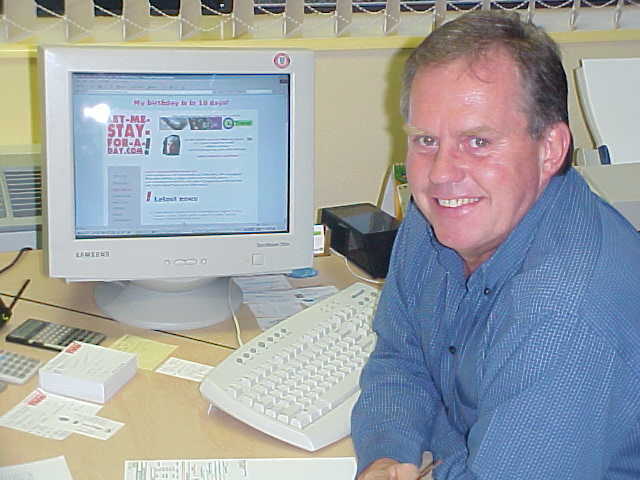 At the office Bob was busy with checking the latest search engines that search for the most cheapest air flights. There is a lot of competition out there and eTravel still should be offering the lowest possible price to their clients. Mark took me out for a spaghetti lunch at the nearby mall and at 4.30 I said goodbye to a lot of people at the office. One lady from eTravel even offered to bring me all the way to the airport. Circling through the little streets of suburbs (I couldn't follow it anymore) to avoid the heavy traffic on the main roads, she dropped me off at the Johannesburg International Airport at 5.30. After standing in a long queue I checked in and went through customs, ready for a long walk along many of the tax-free shops that offers mostly anything men and women should buy but what they would never need. With the left over Rands I had left from my stay at the hotel, I ordered myself two cheeseburgers and a coke and waited until I the television monitors would announce my flight's boarding time. 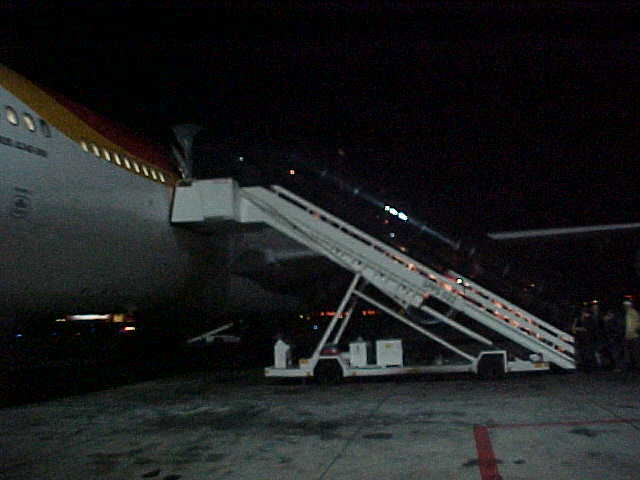 Iberia Airlines is the worst airline I have ever flown with. 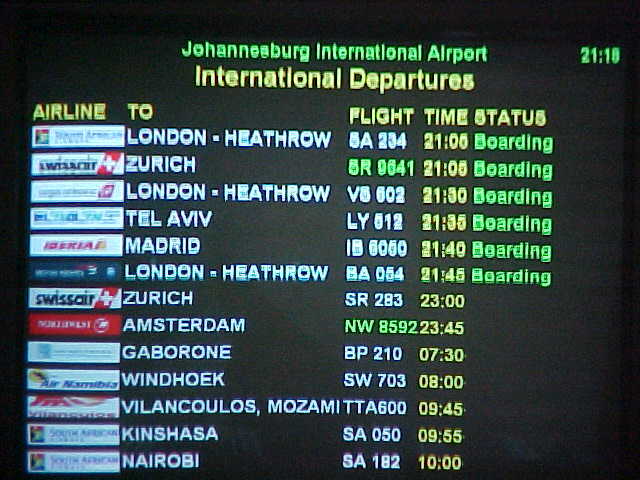 And I flew with Iberia to Johannesburg and this time I flew to Madrid. Let me tell you why. First the plane fills itself up with almost 300 people. 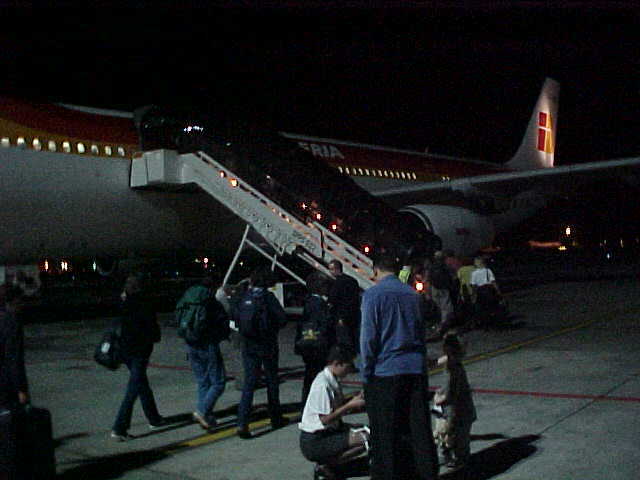 When everybody was boarded, the plane took of at around 10pm. As usual, the humidity level on a plane is very low, so everybody could easily use a drink to stay away from coughing. But the stewards probably thought different about that. 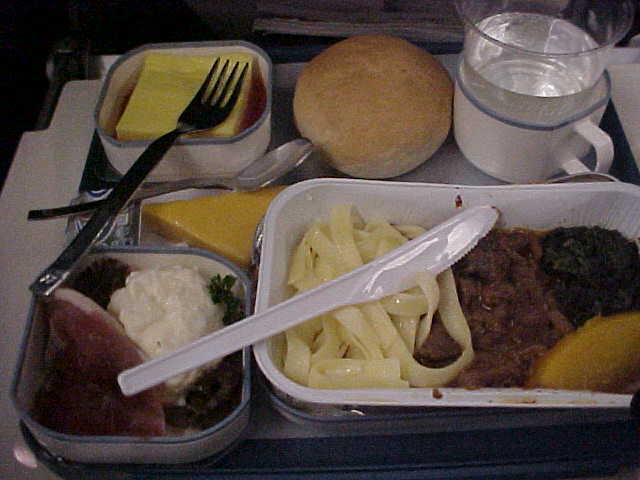 Two hours after the take-off, they gave everybody headphones and half an hour later (0.30 at night) dinner was served. When thirty minutes later the cart passed by I just could not help to order three cokes and two glasses of water, like almost everybody was doing. Rule number one for plane people: the drink should come first. And this time the food was bad too, because I just don't really like to eat something that was warm a few hours ago but now it was very cold. It was pasta with lamb and spinach (with sand in it) and coffin dried salmon on a bed of an indefinable salad pudding. Now tell me I am going awol here, but it was really disgusting. And I noticed I wasn't alone with that thought as most people only ate the dessert. As this was just a colorful hump of sugar. At least there was some onboard entertainment. Not on the TV or through the headphones (that did not seem to work anyway), but by a passenger at the left isle. He drew everybody�s attention when he took of most off his clothing and stood in the isle with only his shorts and shirt on. When the stewards asked him if he was okay the man paranoiac explained in half Afrikaans, half English and a sniff of Spanish that he had some unknown allergy. He did not know against 'what', but it was that serious that doctors where going to search for the answer in Spain. When the plane took off, he was settling down again, wearing other clothing every thirty minutes. The whole time that I was awake on the plane (and believe me, the service keeps you awake), he was jumping up and down his seat, reaching for his hand baggage in the compartment above him for all kinds of strange stuff or he ran to the toilet like every 15 minutes. He wearied dark sunglasses, which must have taken away his complete sight in the plane. Other passengers started to make fun of his strange behavior, as the stewards already called him The Man[b]. Especially when he started arguing with the old lady next to him that she was not allowed to touch him or anything that belongs to him. When he was on one of his 5 minutes toilet visits, the man next to me advised the crew with a loud voice that they should turn of the lights or The Man might get sunburned. Another passenger said The Man might wake up at 3am and do a rain dance. "Turn of the lights, let's see if he glows in the dark!" It was kind of funny, but also quite embarrassing. However the man was really acting world strange and he did not seem to care how overdone foolish he looked to others. 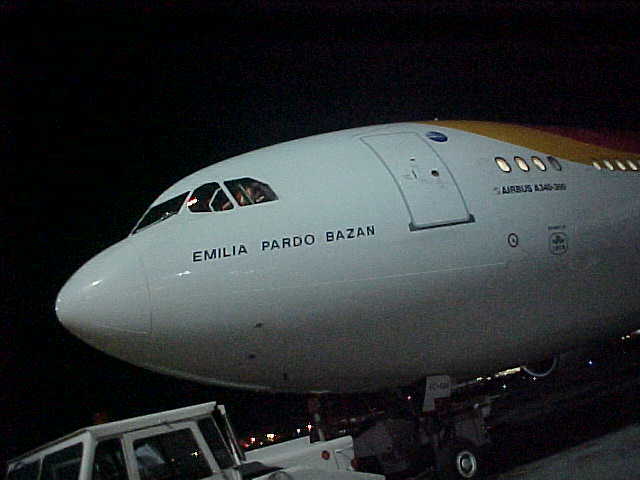 It was around two o'clock at night when the plane was passing the equador with a speed of 800km/hr, while it was only -43 degrees Celsius (-45F) outside. Spain is in another time zone than South Africa, and one hour later is was again 2 am. What a world! Good night Africa and goodbye! Click here to see Ludo's map.